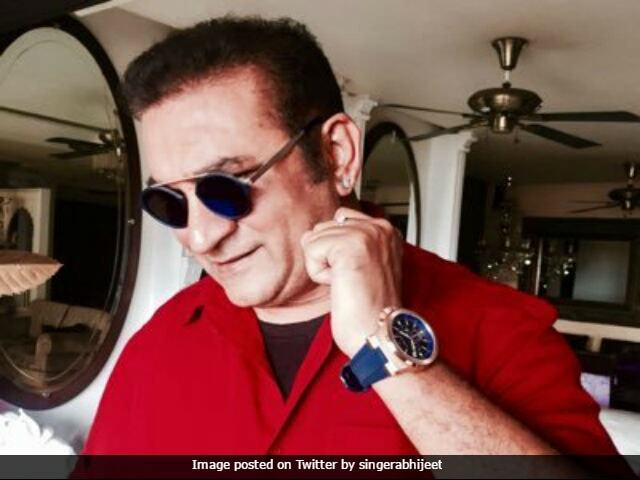 Singer Abhijeet Bhattacharya is back on the micro-blogging site Twitter after his account was suspended by Twitter last week for offensive tweets against certain female users. The 58-year-old singer re-joined the micro-blogging site with a new unverified account on Monday and posted a video. In the video, a defiant Abhijeet Bhattacharya alleged that people are trying to 'curb' his voice. He added that he will denounce those people who criticize the country and the Indian Army. "I have started this new Twitter account till my verified account is not active again. You can only follow me on this account the rest are fake. They are causing me trouble. Boliye jai hind, bharat mata ki jai. Vande Matram. I am back. We will together eliminate all those who raise their voice against the country," said Abhijeet Bhattacharya. Abhijeet Bhattacharya's Twitter account was suspended last week after a tweet he posted about JNU student and activist Shehla Rashid was reported. A day after Abhijeet Bhattacharya's account was suspended, his colleague Sonu Nigam quit Twitter, explaining in 24 tweets that he was saddened by what he perceived as a lack of freedom of speech. Mr Bhattacharya and Mr Rawal are equally entitled to their opinions, he said. On Saturday, filmmaker Ram Gopal Varma also quit Twitter and said he will now remain active on Instagram. Abhijeet Bhattacharya started his Bollywood career in 1990 with the film Baaghi. He has sung for films like Om Shanti Om, Gangster and Dhoom. In the Nineties, Mr Bhattacharya sang for actors like Shah Rukh Khan, Saif Ali Khan and Akshay Kumar.